Commonplacing has been popular since the Middle Ages as a way to collect phrases and sayings. But what happens when we try to pick and choose our religious customs? The Internet flooded the world with information. We weren’t ready for it—not really. A constant stream of thoughts, opinions and ideas—never ending, never abating. There’s more content than any individual could consume in a thousand lifetimes. We’re at the receiving end of a torrent of information, and the quantity is only increasing. How are we supposed to process it all? How are we supposed to sift through it and find what matters? Unique as the Internet is, this isn’t the first time we’ve had this problem. Believe it or not, the European world was grappling with a similar dilemma not long after a man named Johannes Gutenberg invented the printing press. That press changed the world forever. Up until that point, books had been rare and expensive. Now, almost overnight, they became more affordable and accessible. Like a flood, books filled with thoughts, opinions and ideas were making their way across political and cultural borders. There was more content than any individual could consume. Commonplace books exist for a singular purpose—to collect the good stuff and hang onto it. Like journals, they were originally personal, handwritten undertakings—but unlike journals, the point was to fill them with the thoughts, quotes and observations of other people. Throughout the ages, some of the greatest figures of history kept commonplace books. From Thomas Jefferson to Francis Bacon and from Walt Whitman to Napoleon Bonaparte, commonplace books have offered a way for thinkers and dreamers, princes and paupers to create a personal catalog of the thoughts and phrases that mattered to them. Today, 310 years later, commonplace books are anything but extinct. The handwritten kind might not be as common anymore, but you’ve probably come across some modernized versions of the commonplace book. Take Evernote, for instance. Or Tumblr. Or Pinterest. Each of these platforms is designed for collecting the bits of the world that matter to us—the bits that we perceive as having merit or significance. There’s a problem, though: At its core, commonplacing requires looking at a work and saying, “I like this and not that. This is good; that isn’t for me.” And when it comes to things like literature or movies, that’s fine. The problem emerges when we take that approach to things like philosophy and religion, crafting a patchwork buffet of disparate worldviews and then trying to make them all work together. It happens all the time. We live in such a highly customizable world—everything can be personalized, edited and altered to fit our preferences; why not religion too? There are hundreds of religions in the world, many of them thousands of years old—why not take the very best that each one has to offer and meld it together into something that works for you? Because it’s impossible, that’s why. If the religions of the world were jigsaw puzzles, commonplacing religions would be the equivalent of grabbing our favorite pieces from each puzzle and trying to make them all fit together. It won’t work. It can’t work. Those pieces aren’t designed to fit together—and even if we forced them to fit, what would the resulting picture look like? It would be a mess—a total, unintelligible mess. Let’s say you enjoy the Buddhist version of meditation, but you’re also a fan of praying to a higher power. Okay—there are a couple of different issues with that. Buddhist meditation is centered around the belief that the universe is an illusion. If you’re meditating on your own nonexistence, what higher power are you supposed to pray to? How can you merge those two concepts together? What’s the bigger picture? There isn’t one—and the more puzzle pieces you add, the fuzzier everything gets. The end result is a commonplace “Bible” filled with nice-sounding ideas that can’t possibly fit together (and often contradict each other)—a Bible that might take a stab at explaining what to do, but completely flounders when it comes time to explain why it should be done. The Holy Bible is filled with warnings not to take a piecemeal approach to its instructions. 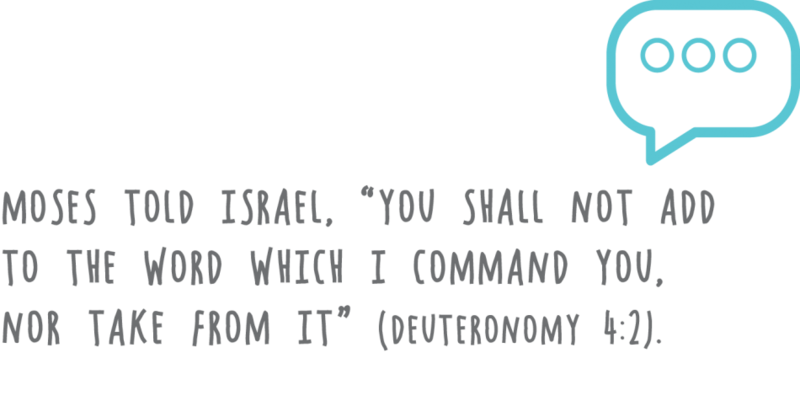 Moses told Israel, “You shall not add to the word which I command you, nor take from it” (Deuteronomy 4:2). The book of Proverbs tells us, “Every word of God is pure. … Do not add to His words, lest He rebuke you, and you be found a liar” (Proverbs 30:5-6). The apostle John warned all those reading the book of Revelation, “If anyone adds to these things, God will add to him the plagues that are written in this book; and if anyone takes away from the words of the book of this prophecy, God shall take away his part from the Book of Life” (Revelation 22:18-19). Why such an emphasis on leaving the Bible unaltered? Because if we start treating the Bible like just another source for commonplacing, we lose the bigger picture. We jumble the puzzle pieces. We make it impossible to see what God is really doing. And what God is really doing is incredible. It talks about, for instance, your purpose in life (Ecclesiastes 12:13). It talks about your reason for existing (Romans 8:18). It talks about what God expects of you (Micah 6:8), and it shows you what to do when you inevitably fall short of that expectation (Acts 2:38). It talks about the boundaries you need to avoid if you want to live a fulfilling life (Deuteronomy 10:13). It talks about the important relationships in your life and how to care for them (Ephesians 5:17-33). But the scope of the Bible is bigger than just you. It also talks about the world (Genesis 1:1), why it is the way it is (Romans 1:18-25), and what God plans to do about it (Romans 8:19-23). It talks about a plan to end evil and suffering forever (Revelation 21:4)—a plan to offer hope to every man, woman and child who has ever lived (Revelation 20:12). That’s the bigger picture as painted by the Bible, which was generated and inspired by a God who invites you to “test all things; hold fast what is good” (1 Thessalonians 5:21). But it’s all or nothing. Developing our own commonplace Bible is a guaranteed way to assemble a puzzle with pieces that don’t fit and a picture that doesn’t make sense. The God revealed by the pages of the Bible is either the God of all creation or He isn’t. There’s no middle ground; no room for a third option. You have to decide whether the Bible is something you can trust. If the answer is no, then the whole book is a worthless bundle of lies. But if the answer is yes—if the answer is yes, then the Bible is the Word of God, inspired and preserved for us throughout the ages by the God of the universe. It’s a direct line of communication from our Creator to us, and it’s filled with all the answers to life’s most important questions. Why would you ever want to commonplace that?